2010 has been a busy year in the DIY Newlyweds household. I have some fun DIY plans for 2011, but before I get into that, here's a review of my favorite projects from 2010. Looking back, I was pretty busy bee this year! Pssstt...If you like some of my projects, I'd love it if you follow my blog! I'm linking up to Southern Hospitality, House of Hepworths, The Lettered Cottage, The DIY Showoff, Be Different Act Normal link parties- check out some of the other great projects featured! Since Christmas has come and gone, I figured now would be a good time to share some photos of my Christmas decor! Better late than never, right? In between all the preparations for the holidays, working, our trip to Florida, and shopping for gifts I didn’t even get around to photographing my tree until Christmas Day! This year, I used only white lights and decorated the tree with mainly gold ornaments. 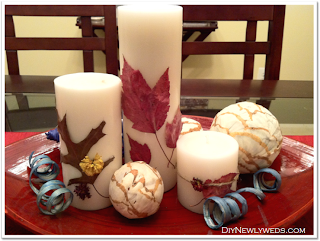 (You can check out last year’s red and gold tree and the rest of my decor here). We still hung all of our special and childhood ornaments, but the rest of the tree was decked out in gold, or at least partially gold, ornaments. The mantle received the gold treatment this year too. I skipped the stockings on the mantle this year and instead used a cascading green with gold garland wrapped around it. This was the first Christmas since we expanded our mantle shelf so I had more room to decorate and placed poinsettia and gold pinecone decorations on top of the mantle. The mantle is also lit up with a small string of white lights and mini lighted gold Christmas trees on each end. Instead of stockings on the mantle, I hung them on our stair railings this year along with more green garland, white lights, and touches of gold pinecone decorations to match the mantle. The end table in our family room kept its usual decor, but got spruced up for the holidays with ornaments inside of our white lanterns and a sprig of evergreen in our little green vase. On the coffee table, I made our usual candle tray (seen here decorated for summer) more festive with fake snow, a snowman candle, and cute mini ornaments. But my very favorite Christmas decoration is this little guy under our Christmas tree. Nothing looks more festive than my four-legged best friend donning a Santa hat and beard! I keep my holiday decorations up until after New Years, so we will still have a couple more weeks to enjoy the dolled up house. It always makes me so sad to take the festive decor down. How about you, do you leave your decorations up into January or are they down by the time the last present is unwrapped? If you’ve been following along with DIY December, the fun isn’t over yet! I’ll be sharing some New Years inspired ideas over the next week, so stay tuned! When we were “trimming” our Christmas tree this year (more about that later) some of the bottom branches had to be cut off. I felt bad just throwing out the pretty branches so I held onto them hoping to find another way to use them. Lo and behold, an idea struck me as soon as I came across some spray paint in the garage. I decided to spray one tree branch gold and another one white. Truth be told, the white branch didn’t turn out very well so I ended up painting over it with the gold spray paint. I used a light coating of spray paint only on the front of the branches so some of the natural green color still showed through. Once dry, I put the branches in a glass vase which I snagged at the Dollar Store (for just $1 buckaroo!) and filled the vase with fake “snow” flakes. The new arraignment looks so pretty on my coffee table. I placed the painted branches on a red charger tray and surrounded it with some more snowflakes and matching red and gold ornaments. So what do you think? Have you found any ways to reuse extra Christmas tree branches? Books are easy to find and always make for a nice gift for anyone including children, family, or coworkers. If you're buying for a fiction lover, I recommend The Time Traveler's Wife (it's an amazing book, but you'll need a box of tissues while you read it!) . If non-fiction is more their thing, I recommend Eating Animals for anyone who is concerned about eating healthy or helping the environment. Book gifts can be personalized by adding a nice inscription inside of the book cover or by making your own bookmarks like these cute ones. DVDs are another easy to find gift that you can purchase just about anywhere. TV shows on DVD are always a hot hot holiday gift and your gift recipient will be able to get more viewing time out of a TV series on DVD than just a 2 hour movie. TV shows from the 80s and 90s, like my ultimate favorite The Golden Girls , make great nostalgic gifts. Popular TV shows like Glee , which I've been wanting to check out, make fun gifts too. To add a personal touch to a DVD gift, try adding a sweet treat like chocolate candy popcorn. Me love cookies, nom nom nom nom nom! If you need a gift for the Cookie Monster, or a friend with a sweet tooth, you can't go wrong with a batch of cookies. I'm planning on trying these Chocolate Peanut Butter Cookie and Oatmeal Chocolate Pecan Cookie recipes this year. If prepared cookies aren't feasible (because maybe you're traveling or mailing the gift), cookie mix in a nicely decorated jar makes a great gift too. It can be hard to find gifts for someone's home because there is always the risk of them already having the item or getting the color scheme wrong, but there are a few pretty safe gift options for the home. Picture frames always make a nice present and the recipient will likely be able to find a place for it whether it's in their home or office. 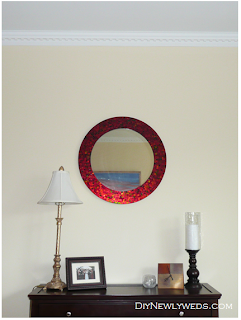 And you can add a personal touch by including a special photo in the frame. Throw blankets are another nice gift idea because soft and cozy gifts are so nice to get and because they can usually be used in multiple rooms in the house so there's always room for another one. Both of these gift ideas are available online or in-store at Target. If you're gifting to the person who has everything or doesn't want anymore "stuff," try giving a charitable donation. While I wouldn't recommend donating to the The Human Fund, charitable donations to real organizations can give the gift of a warm and fuzzy feeling to the recipient and provide a very needed donation to help those in need. My charity of choice is Heifer International. Through Heifer International, you can give the gift of chickens, ducks, cows, and other animals to impoverished families throughout the world. Those families will use the chickens (or other animal you gift) to lay eggs for nourishment and will sell any extra eggs as a source of income for themselves, often to afford to provide schooling for their children. The gift keeps on giving because once the family lands on their feet, they will be able to pass along additional chickens to other families in need. You can learn about this great organization and donate by visiting their website. It's a great way to pass along the Christmas spirit! For more last minute gift ideas, check out some homemade gift ideas.